Valhalla Ambulance is made up of Volunteers providing emergency medical services and transportation primarily to the Valhalla and North White Plains area. In early 1961, a young local resident was critically injured in an automobile accident on the Valhalla border of the Bronx River Parkway. An ambulance was dispatched, however, response time was slow and the injuries to this young child proved fatal. Four men, all residents of Valhalla, New York, began discussing the tragedy and concluded that if Valhalla had its own ambulance corps, fatalities of this sort could be prevented. So, Bill Pfleiderer, Bert Cesari, George Slotnik and Martin Gross decided to form the Valhalla Volunteer Ambulance Corps (Valhalla VAC). With no funding, these men began recruiting volunteers and training them in first aid procedures. The Valhalla Post of the American Legion, Post 1038, demonstrated their support by providing a loan, later to become a gift, to enable the Valhalla VAC to purchase a used ambulance from their neighbors the Pleasantville Volunteer Ambulance Corps. The "Green Bomb", as it was affectionately named, was a 1952 Cadillac weighing 6800 pounds. Our First Ambulance, the “Green Bomb.” A 1952 Cadillac weighing 6800 pounds. On July 23rd, 1961 at 6:00 am, the Valhalla VAC began operating and received three calls on their first day of service. With 23 members, the Corps provided service to approximately 1500 families and was available at no charge 24 hours a day. By April of the following year, Valhalla VAC had logged 37 calls and after a full year of operation, the volunteer membership had increased to 43. The ambulance was stocked with 41 different items; a sharp contrast to the more than 125 items presently on-board modern BLS (Basic Life Support) ambulances. Valhalla VAC operated with 3 Corpsmen per call, all trained in Basic and Advanced First Aid and Rescue Techniques. For the first 29 years of operation, Valhalla VAC relied solely on the generous contributions from the community it served, conducting fund-raising events, house to house canvassing and mailings to request donations. Donations came in, not only in the form of money, but contributions of labor, materials and time helped Valhalla VAC to maintain its operation. 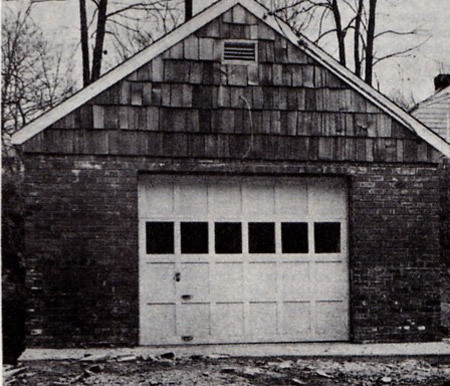 The first address of the Valhalla Ambulance Corps was an old garage owned by a Valhalla resident and was used to house the ambulance for the first 4 years. 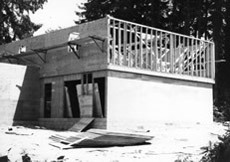 In February 1964, the Raven Rock Nursery was being torn down and Valhalla VAC personnel began dismantling the building, salvaging everything that could be used to construct a new ambulance garage on Davis Avenue and Legion Drive. This period was perhaps the most frustrating time in Valhalla VAC's history. After the new building was 90 percent complete, residents began to object to the location of the driveway and the proximity of the building to the front property line. Allegations were made that the permit application had not been properly filed and construction was halted in June of 1964. A variance was requested, but after 5 months of deliberation, was denied and Valhalla VAC was ordered to move the building 150 feet back on the property and relocate the driveway. Once again, the VAC and community volunteers demonstrated their support and overcame the obstacle, finally moving into third newly completed headquarters on June 9th, 1965. Just prior to the VACs relocation and during this emotionally charged time period, the Chairman of the Mt. Pleasant Zoning Board announced his retirement, stating the "being accused of being 'anti-ambulance corps' was the straw that broke the camel's back." 1965 Valhalla Ambulance Corps Headquarters. By the end of 1965, things settled down and VAC was able to order its first new ambulance, a maroon and white 1966 Cotner Bevington built on an Oldsmobile 98 chassis at a cost of $14,900. They also received an award from the New York State Volunteer Ambulance Association for an accident-free record for 1964-1965. Unfortunately, this period of relative “smooth sailing” was disrupted when, in January of 1970, this ambulance was wrecked while transporting a patient with a broken hip to a local hospital. A car skidded on the slippery, frozen ground and crashed into the ambulance, seriously injuring some of the crew. Thanks to the Pleasantville Ambulance Corps, coverage was provided to the community until a replacement ambulance could be obtained. In the early ’70s, many of the area’s ambulance corps, including Valhalla, began staging mock disasters to establish camaraderie among the Corps and test their preparedness for mass casualty incidents; a tradition that exists to this day. These drills have included simulated bus accidents, train wrecks, airplane crashes and even a 1975 “Kensico Dam Has Burst” drill. During the first 15 years of Valhalla VAC’s existence, they had established themselves as an integral part of the community and expanded their territory to include the neighboring town of North White Plains. The VAC also progressed to a point where, by 1976, a certified Emergency Medical Technician (EMT) was on-board for every call. By 1977, Valhalla VAC had begun to outgrow its headquarters which could not accommodate their second ambulance. Acts of vandalism had been committed on the building and on the ambulance which was parked outdoors. The New York City Water Department, which owned the property around the reservoir granted a land permit to Mt. Pleasant allowing the erection of a new headquarters on a 2 acres parcel of land on Westlake Drive and Prospect Avenue; the current location from which Valhalla VAC still operates. The VAC bank account at this time had approximately $15,000 and the new building was estimated to cost close to $100,000. Again, committed, dedicated VAC volunteers and residents pitched in. A local architect donated the plans, a contractor donated his expertise and equipment and significant contributions were made by local organizations and corporations such as the Lion’s Club, the Women’s Club of Valhalla, Savin Corporation, New York Telephone, Pepsico and IBM. The proper permit applications were filed and granted and ground was broken on December 7th, 1980, but not without difficulties. A group of 8 residents of Westlake Drive decided to bring suit against the Corps, the town of Mt. Pleasant, and the building inspector demanding that the permit be revoked on the grounds that the permit ignored fire and building codes, that the plans were not properly signed by the architect and that the completed building would be an eyesore. The plans were reworked to ensure that the new headquarters would blend in well in the residential area and construction proceeded until the building was completed in the Fall of 1983. A certificate of Occupancy was issued in late ’84 and on October 14th of that year, the new Headquarters was dedicated. The construction of our current headquarters on 1 Westlake Drive in Valhalla, New York. That same year, another victory took place for the Valhalla VAC. After 3 years of hard work and careful planning, the Corps was able to convince the towns of Mt. Pleasant and North Castle to institute taxing districts, something that had been done for the Fire Departments for many years. This allowed Valhalla VAC to receive tax dollars to aid in the cost of operations. Today, the Valhalla Ambulance Corps still relies heavily on its yearly fund drive and other donations, but had instituted a Revenue Recovery System to help aid in the increasing costs of day-to-day operations. In early 1961, a young local resident was critically injured in an automobile accident on the Valhalla border of the Bronx River Parkway. An ambulance was dispatched, however, response time was slow and the injuries to this young child proved fatal. Four men, all residents of Valhalla, New York, began discussing the tragedy and concluded that if Valhalla had its own ambulance corps, fatalities of this sort could be prevented. So, Bill Pfleiderer, Bert Cesari, George Slotnik and Martin Gross decided to form the Valhalla Volunteer Ambulance Corps (Valhalla VAC). With no funding, these men began recruiting volunteers and training them in first aid procedures. The Valhalla Post of the American Legion, Post 1038, demonstrated their support by providing a loan, later to become a gift, to enable the Valhalla VAC to purchase a used ambulance from their neighbors the Pleasantville Volunteer Ambulance Corps. The "Green Bomb", as it was affectionately named, was a 1952 Cadillac weighing 6800 pounds. Our First Ambulance, the “Green Bomb.” A 1952 Cadillac weighing 6800 pounds.On July 23rd, 1961 at 6:00 am, the Valhalla VAC began operating and received three calls on their first day of service. With 23 members, the Corps provided service to approximately 1500 families and was available at no charge 24 hours a day. By April of the following year, Valhalla VAC had logged 37 calls and after a full year of operation, the volunteer membership had increased to 43. The ambulance was stocked with 41 different items; a sharp contrast to the more than 125 items presently on-board modern BLS (Basic Life Support) ambulances. Valhalla VAC operated with 3 Corpsmen per call, all trained in Basic and Advanced First Aid and Rescue Techniques.For the first 29 years of operation, Valhalla VAC relied solely on the generous contributions from the community it served, conducting fund-raising events, house to house canvassing and mailings to request donations. Donations came in, not only in the form of money, but contributions of labor, materials and time helped Valhalla VAC to maintain its operation. The first address of the Valhalla Ambulance Corps was an old garage owned by a Valhalla resident and was used to house the ambulance for the first 4 years.In February 1964, the Raven Rock Nursery was being torn down and Valhalla VAC personnel began dismantling the building, salvaging everything that could be used to construct a new ambulance garage on Davis Avenue and Legion Drive. This period was perhaps the most frustrating time in Valhalla VAC's history. After the new building was 90 percent complete, residents began to object to the location of the driveway and the proximity of the building to the front property line. Allegations were made that the permit application had not been properly filed and construction was halted in June of 1964. A variance was requested, but after 5 months of deliberation, was denied and Valhalla VAC was ordered to move the building 150 feet back on the property and relocate the driveway. Once again, the VAC and community volunteers demonstrated their support and overcame the obstacle, finally moving into third newly completed headquarters on June 9th, 1965. Just prior to the VACs relocation and during this emotionally charged time period, the Chairman of the Mt. Pleasant Zoning Board announced his retirement, stating the "being accused of being 'anti-ambulance corps' was the straw that broke the camel's back." 1965 Valhalla Ambulance Corps Headquarters.By the end of 1965, things settled down and VAC was able to order its first new ambulance, a maroon and white 1966 Cotner Bevington built on an Oldsmobile 98 chassis at a cost of $14,900. They also received an award from the New York State Volunteer Ambulance Association for an accident-free record for 1964-1965. Unfortunately, this period of relative “smooth sailing” was disrupted when, in January of 1970, this ambulance was wrecked while transporting a patient with a broken hip to a local hospital. A car skidded on the slippery, frozen ground and crashed into the ambulance, seriously injuring some of the crew. Thanks to the Pleasantville Ambulance Corps, coverage was provided to the community until a replacement ambulance could be obtained. In the early ’70s, many of the area’s ambulance corps, including Valhalla, began staging mock disasters to establish camaraderie among the Corps and test their preparedness for mass casualty incidents; a tradition that exists to this day. These drills have included simulated bus accidents, train wrecks, airplane crashes and even a 1975 “Kensico Dam Has Burst” drill. During the first 15 years of Valhalla VAC’s existence, they had established themselves as an integral part of the community and expanded their territory to include the neighboring town of North White Plains. 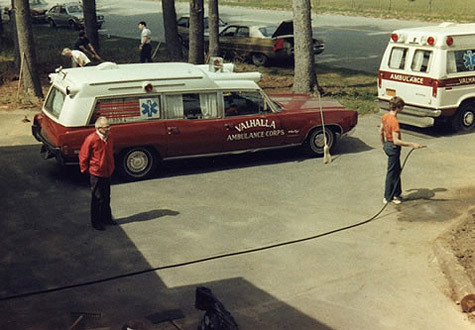 The VAC also progressed to a point where, by 1976, a certified Emergency Medical Technician (EMT) was on-board for every call.By 1977, Valhalla VAC had begun to outgrow its headquarters which could not accommodate their second ambulance. Acts of vandalism had been committed on the building and on the ambulance which was parked outdoors. The New York City Water Department, which owned the property around the reservoir granted a land permit to Mt. Pleasant allowing the erection of a new headquarters on a 2 acres parcel of land on Westlake Drive and Prospect Avenue; the current location from which Valhalla VAC still operates. The VAC bank account at this time had approximately $15,000 and the new building was estimated to cost close to $100,000. Again, committed, dedicated VAC volunteers and residents pitched in. A local architect donated the plans, a contractor donated his expertise and equipment and significant contributions were made by local organizations and corporations such as the Lion’s Club, the Women’s Club of Valhalla, Savin Corporation, New York Telephone, Pepsico and IBM. The proper permit applications were filed and granted and ground was broken on December 7th, 1980, but not without difficulties. A group of 8 residents of Westlake Drive decided to bring suit against the Corps, the town of Mt. Pleasant, and the building inspector demanding that the permit be revoked on the grounds that the permit ignored fire and building codes, that the plans were not properly signed by the architect and that the completed building would be an eyesore. The plans were reworked to ensure that the new headquarters would blend in well in the residential area and construction proceeded until the building was completed in the Fall of 1983. A certificate of Occupancy was issued in late ’84 and on October 14th of that year, the new Headquarters was dedicated. 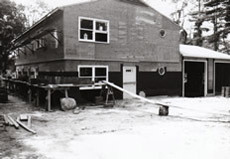 The construction of our current headquarters on 1 Westlake Drive in Valhalla, New York.That same year, another victory took place for the Valhalla VAC. After 3 years of hard work and careful planning, the Corps was able to convince the towns of Mt. Pleasant and North Castle to institute taxing districts, something that had been done for the Fire Departments for many years. This allowed Valhalla VAC to receive tax dollars to aid in the cost of operations. Today, the Valhalla Ambulance Corps still relies heavily on its yearly fund drive and other donations, but had instituted a Revenue Recovery System to help aid in the increasing costs of day-to-day operations.